There are plenty of video games based on board games. And board games based on video game properties. But a board game genuinely inspired by video games? Please, Rivet Wars, continue. Perhaps unsurprisingly, given this pitch, the game is the brainchild of Ted Terranova, a former developer at Big Huge Games (Rise of Nations) who has taken that RTS experience and turned it into one of the most interesting ideas for a board game I've seen in ages. 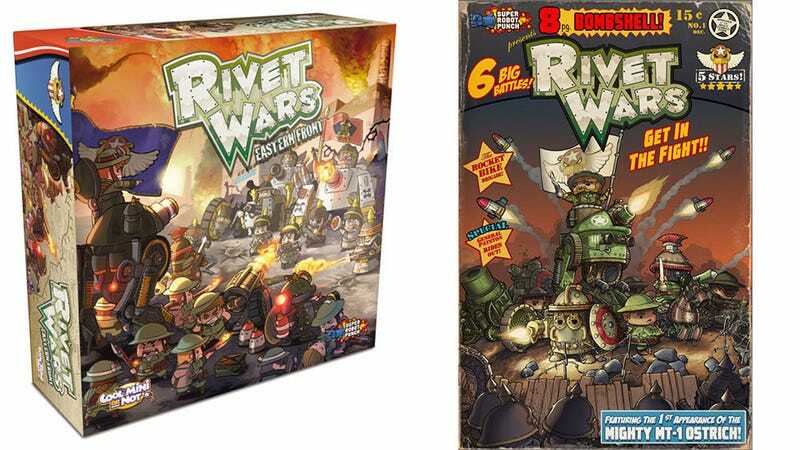 Rivet Wars borrows two key elements from games; the goal is to capture command points which let you create more units, while the units themselves can be upgraded and customised not with cards or tokens, but by literally attaching things to their little plastic turrets. The whole thing has a wonderful First World War aesthetic, somewhere between Toy Soldiers and Iron Brigade. Rivet Wars is a Kickstarter project, but before you go thinking this is a pitch post—or that this will likely never be made—know Terry only asked for $20,000, and has received over $160,000 in backing. So far.